90% of funding is from the government in different capacities (city, province, national). There is very little fundraising. One anonymous donor contributes funds specifically for a bi annual recognition prize that awards $5000 to a woman artist and $2,500 to two runners up. Founded in 1973, La Centrale Galerie Powerhouse is one of Quebec’s oldest artist-run centers. The gallery exhibits and serves a broad spectrum of artists and projects, including many who are often under-represented within established art institutions. Its mandate expands on a history of feminist art practices and aims to provide a platform for contemporary art that is informed by feminist and gender theory, as well as intercultural and trans-disciplinary practices. This involves the development of artistic and professional exchange at the local, national and international levels. La Centrale exhibits work by artists of all genders. To encourage intergenerational dialogue, they welcome artists at any stage of their career. The programming of the gallery reflects the interests and commitments of its members. X: We had arrived in Montreal the night before meeting with La Central and spread out our collection of their publications on the floor of the apartment where we were staying, and marveled over our stash. Over the summer I had read Feminisms Eletrique from cover to cover in one fell over-excited swoop. It was a beautiful tome filled with an awesome array of writing ranging from theoretically inspired reflections on internal changes that the gallery was going through to an interview with Chris Kraus and interviews between artists. I had put sticky notes on the pages around an article written by the members of Lesbians on Ecstasy and left the book in the bathroom of the Dirt Palace. The book began to get dog-eared in the best way, from the love of daily reading. Our full collection of their publications numbers thirteen, and includes some exhibition catalogs. As we discussed our plan for meeting with La Central, we were worried that we’d have TOO MANY QUESTIONS! P: I looked at my notes, We were to meet Véroniqe Boilard the Artistic Director and a board member Emma-Kate Guimond. We wondered if that was one of them on the bench outside. Coral Short is an friend from Montreal who we got to know when she did a self directed residency at the Dirt Palace in 2014. We were trying to meet up with her on this visit, but it seemed like she had taken the proverbial horse by the reigns and come and found US! This was the first sign that this whole process of conducting site-visits was going to be an exercise in improvisation – this was our first interview, it hadn’t even started yet & all of our plans were going out the window! Coral is a force like no other and we always want her on our team so we brought her into the gallery, which was really great, because she helped us to dive right into a conversation about how Francophone and Anglophone feminisms differ, are concurrent, and how both strains have shaped the political and creative landscapes of Montreal. Véroniqe, Emma-Kate & Coral were very open in their characterizations. The basic sense was that Anglophone feminism was more queer influenced and quicker to embrace trans inclusivity, Francophone culture brought to the table a deep history of political activism and fierceness. X: We wound our way through the gallery’s origin story. La Central had started in 1973, they fully incorporated in 1974, they originally worked out of an apartment, as they grew they moved. In total La Central has occupied six different locations. From the start there has been a rejection of hierarchical structure in the management, both in terms of the staff and the board. For the sake of registering with the state there are traditional positions like ‘board president’ but on the web-site these distinctions are not announced. On the staff level, there are different positions and roles, but the organization is flat with all of the staff reporting to and working closely with the board. The organization is structured as a membership organization – meaning that members have two annual meeting and vote for a slate of board members. The only organizations that I can think of in Providence who are structured in this way are DARE and ONA – i.e. very grassroots political organizations. P: Much about La Central’s structure and operations today practically embodied the philosophies and ethics proposed by this feminism of the 70’s in creating alternatives to top down power structures. Véronique and Emma-Kate self described as conduits to members — not fulfilling personal visions but supporting and materializing visions of the membership. An engaged membership directed the path of the programing. Those bi-anual general assemblies are times when many decisions are made. The budget is even presented to members in detail, and members ask about specific budget lines expecting reasoning from staff and an ability to explain the budget. X: Veronique and Emma-Kate had both been involved with the organization in the current capacities for a relatively short period of time. Veronique has been in her post for less than a year, and Emma-Kate has been on the board for about 3 years. 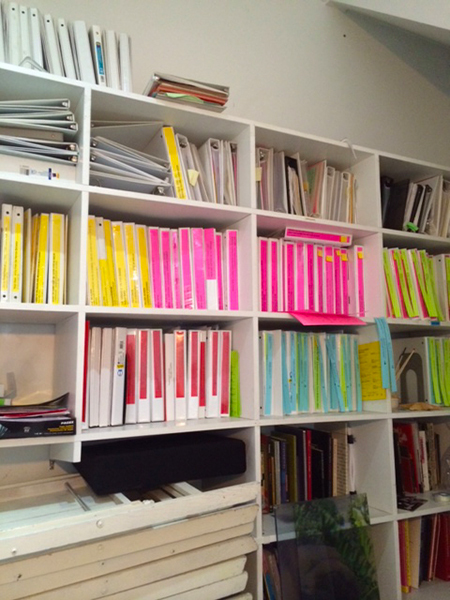 Institutional memory is created through a rigorous documentation process – their office shelves are home to about a hundred binders with neon pink spines detailing the past five years of every show and set of meeting minutes. Archives from the period prior to five years are stored at Concordia University and are accessible to researchers and the general public. P: YEAH! What I found most inspiring about La Central (even outside of their horizontal approach to decision making and operations, and political visibility) was their systematic documentation and publications projects. The documentation practice is rigorous and beautiful. 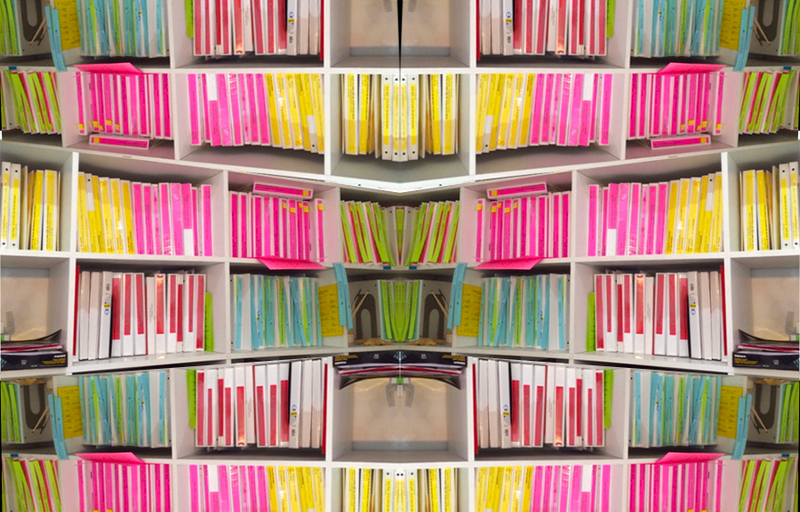 Each year housed in different colored binders. (NOT JUST PINK BINDERS XANDER!!! I swear you only see hot pink!!!) Accompanying the minutes and administrative paperwork are all event posters, postcards, articles written , Images of the exhibition (digital as well as printed images). The beauty of their promotional materials is also inspiring. The organization has incorporated a publishing practice in conjunction with this data and historical document collection. The books are beautiful objects, each designed in a different format. The content of the books is not directly related to the organization documentation but a snapshot of the art work and ideas circulating at the time. 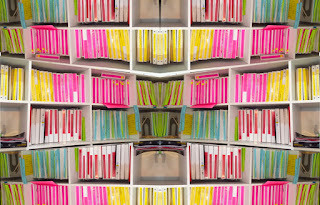 A writing committee creates the copy for these publications and although the staff did not seem to be 100 % on the same page as me — I see the the writing as a wonderful space for reflection on the philosophies and thoughts of the membership — through articulation they are giving these thoughts materiality and presence where otherwise they may have never been fully realized. X: When asked if there was an organizational practice that was unique to La Central that they were proud of, Veronique and Emma-Kate took a moment to think. Coral jumped in, “You guys organize your members to participate together in political actions”. Veronique and Emma-Kate looked at us, as if they were surprised that this was not a common practice – their eyes said: ‘you mean that it’s rare for a gallery to show up together in the street to support a variety of social causes’. I thought for a minute. It’s not rare for artist’s to be political, and it’s not rare for them to be activists, but it’s rare that an exhibition space is also an organization that has put consistent energy for decades into getting artists into the streets TOGETHER, for a wide range of social issues. I thought about last winter’s Black Lives Matter actions, and how almost every present and past member of the Dirt Palace who still lived in Providence was out there in the streets, and how we had in some round-about way supported each other in our political growth, but we’d never been systematic or super intentional about it. Would it make sense for us to be? How might this fit in with our current culture, and general sense that we aim to be open to people approaching feminism from a variety of philosophies, experiences and backgrounds?